It was in Haydn's Piano Concerto Hob. XVIII:11 that the Austrian pianist Ilse von Alpenheim (b.1927) made her first public appearance as soloist at the age of nine. In 1971 she married the Hungarian conductor and composer Antal Doráti (1906-1988), who recorded (with Decca) a complete cycle of Haydn's symphonies with the Philharmonia Hungarica between 1969 and 1972. He was only the second conductor to do so after the pioneering accounts by Ernst Märzendorfer and the Vienna Chamber Orchestra in the 1960s. It was her husband that provided von Alpenheim with the encouragement to study the complete body of sonatas; up until that time she was only familiar with, and had performed, seven. The discovery was to change her life. 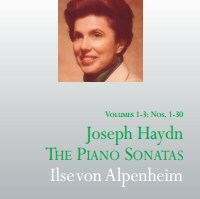 Between 1977 and 1979, she set down a complete cycle as well as the concertos and concertinos. This is the first time the cycle has appeared on CD; it was first issued (in the USA only) in November 1981 on Vox LPs (SVBX 5410). Complete cycles of Haydn's keyboard sonatas have appeared in many guises, played on harpsichords, clavichords and fortepianos. This version was recorded on a modern concert grand (Steinway). Von Alpenheim uses the Vienna Urtext, edited by Christa Landon. She observes all first movement repeats, and both repeats in the final movements, saying that the music ‘call(s) for them organically’. The sonatas were all recorded in chronological order. I’m not familiar with Ilse von Alpenheim, and this is the first time I’ve heard her playing. I’m enamoured by the elegant and stylish approach she brings to these compelling works. There’s never a dull moment; she breathes life and freshness into the music with her imaginative insights and musical intelligence. Her deft finger work and judicious pedalling, aided by a superbly regulated instrument, fairly brightly voiced, with rounded, warm tone, and a sympathetic acoustic, ensure clarity of passagework throughout. Instinctive phrasing, dynamic variance and a total lack of exaggeration all come together to make these some of the finest Haydn piano sonata recordings I’ve ever encountered. At no time did I feel Ms von Alpenheim’s tempi less than comfortable. Ornamentation and embellishments are in style and tastefully executed, a good example being the first movement Allegretto innocente of the G major Sonata Hob.XV1/40. The Presto finale of the same sonata is sprightly and vivacious, not a mad scramble to the finishing line like some performances I’ve heard. Although I’ve studied and played some of the later sonatas, I’m not at all conversant with the very early ones. Listening to the first three volumes, I’m struck by their invention and ingenuity. Haydn wrote them for the harpsichord, but they work extremely well on the modern piano. The product of a fertile imagination, they’re remarkably unpretentious, yet tuneful, and it’s a pity they aren’t performed and recorded more often. Of the later sonatas, a favourite is the Piano Sonata No. 49 Hob. XV1:36 in the unusual key of C sharp minor. The first movement, with its complicated rhythms, is deftly articulated. Its serious character is assuaged by the more genial Scherzando middle movement. The Minuetto which follows is melancholic. Von Alpenheim captures the contrasting moods throughout. There’s some sparkling, diaphanous finger-work in the Allegro of the rarely heard Sonata No. 34 in D major Hob. XV1:33. After an eloquently contoured Adagio, the Tempo di Menuet is played with poise and finesse. Haydn’s sense of humour is brought out in the opening movement of the Sonata No. 50 Hob. XV1:37. The performance truly exudes that infectious wit and affability so often found in Haydn’s music. The Largo, which leads without a break into the Presto, has an improvisatory feel. All is capped off with a finale of verve and vigour. The Sonata in E flat major Hob XV1:52, Haydn’s grandest and boldest, is truly monumental in von Alpenheim’s hands. Her bold approach to the opening movement is reinforced by plenty of dramatic intent. In the Adagio she elicits warmth and expression, with the quirky finale dispatched with scintillating panache. The only disappointment is the first movement Moderato of the magnificent Sonata in C minor Sonata, Hob. XVI:20, which sounds rather tentative and doesn’t seem to flow as freely as does Alfred Brendel’s account. The excellent, scholarly notes by Richard Freed, extend to twenty-two pages. I assume they are the original liner-notes of the LP sets. They discuss in detail Christa Landon’s pioneering work in compiling a comprehensive urtext. This makes for a fascinating read, as well as providing a chronological survey of the oeuvre. The nine CDs are available as three 3-CD sets in flexi polypropylene (unbreakable) CD-size boxes. Each contains track-listings and timings. The booklet comes separately in a plastic envelope. I must heartily commend The Antal Doráti Centenary Society for restoring these significant recordings to circulation in outstanding transfers.